Your dream is becoming a reality. At no cost and with no risks. With our partner programs “Friends & More” and “Professional L”. Are you fond of travelling to experience new countries and cultures? Or have you specialized in a region (for example, Andalusia) or a theme (such as surfing) and know the best spots, the most beautiful beaches, antique restaurants and real insider tips? Is there any material on the Internet from your travels? 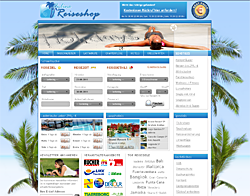 Do you already have a website with your photos and travelling ordeals or on a travelling blog or a Facebook profile? Or have you thought of this idea for some time now? Great! We offer you the opportunity to do so with our partner program. It’s simple, professional and reputable. t is totally risk-free and you can access it free of charge. We work with more than 120 tourist service providers, and together, we mediate or sell travelling packages and other related products on their behalf. We have developed professional advertising tools such as destination search filters, booking systems, banners, templates and fully packaged travel shops. We not only use these tools but they are also made available to our partners. You can embed these advertising media on your website, blog or Facebook profile. It’s easy. You will receive a commission for each booking processed via your online platform. It is called WKZ = Advertising grant is a fixed amount of money that you can freely dispose of. Why not go for it? It's so simple. The big travelling agencies, online platforms, hotel chains and shipping companies have been doing this for a long time. Many have been participating in our affiliate program for years now and earn a lucrative and continuous additional source of income. We are now offering this opportunity to individuals, small travelling-affiliated groups and SMEs. With the integrated platform and your partner ID, information is transferred automatically at the time of booking. This allows us to provide directly booking, and in return you are credited with the corresponding advertising grant. Through your partner login, you can get an accurate overview of the bookings made and your earnings on the go. Why are we giving you this offer? What are we offering you? We can use their personal brands, knowledge and ability to inspire people passionately. In return, you benefit from our expertise and efficacy in the tourism industry. The full service portfolio. For free. We care about the products, the booking as well as the complete processing. We also offer professional, customer-centered support at our service center. We are open to our customers 7 days a week, 365 days a year. At no cost. This ensures you get as much traffic on your website as possible. The market is available. And so is the opportunity to make money. Germans are spending more money on travelling than ever before. The only question is: who deserves this opportunity? Why not you – together with us and the tour agencies? – or with selected goals and a theme. With your pictures, tips and stories, you can awaken the wanderlust in people. and earn from every booking made through your website. We will take care of everything else. Many of our partners, who earn a living through travel sales on their website, started small. We will offer you extensive support from over 500 advertising media and provide you current product information, tips and tricks for search engines, etc. As noted earlier: For you, everything is free! We would be pleased to arrange for a one-on-one meeting in our offices where we will show you everything you need to know and answer all your pertinent questions. Once you have signed up for free, you can start immediately. We will provide you with all the necessary advertising resources you need in your partner account for free. Conclusion: You have nothing to lose – just too much to win. Do you want to earn money with your travelling experience? Definitely! Do you like travelling and would like to do it much more often? Then make your passion a source of income and become an ambassador of your favorite destinations We will show you how to do this. What are the benefits of the different partner levels?